Catcher Jordan Pacheco has accepted his outright assignment with the Diamondbacks and will head to Triple-A Reno, Steve Gilbert of MLB.com tweets. The D-backs designated Pacheco for assignment last week after he hit .242/.333/.333 in 78 plate appearances. As expected, the Blue Jays have selected the contract of lefty Phil Coke, per a club announcement. Coke worked out of the Cubs bullpen earlier in the year, showing a big fastball and strong peripherals (8.1 K/9, 2.7 BB/9, 63.6% GB%) but struggling nonetheless to keep runs off the board. Toronto will hope that Coke can provide a useful southpaw component in the pen as the team assesses its options heading into trade season. The Braves have outrighted outfielder Eric Young Jr. to Triple-A, the club’s top affiliate announced on Twitter. Young, 30, has slashed just .169/.229/.273 in 85 big league plate appearances this year. After opening the season with a significant role, Young’s playing time dwindled to a trickle with his struggles and the resurgent play of late addition Cameron Maybin. Also headed to Gwinnett is righty Alex White, who has signed a minor league deal with the Braves just days after being released by the Astros. The 26-year-old, former top-100 prospect has not lived up to his pedigree in recent seasons. His stock had already fallen by the time Houston acquired him from the Rockies before the 2013 season, and Tommy John surgery caused him to miss that whole year. Since then, White has allowed over six earned runs per nine innings at the Triple-A level. This season, he struck out only 18 batters in 43 2/3 frames. The Astros have released righty Alex White, a former first-round pick (15th overall) of the Indians, according to Bryant-Jon Anteola of the Fresno Bee (via Twitter). Once a consensus top-100 prospect, the now-26-year-old was a significant part of the deal that sent Ubaldo Jimenez to Cleveland back in 2011. After moving swiftly through the minors with outstanding results in his first two seasons as a pro, White threw 149 1/3 innings of 6.03 ERA ball at the major league level over 2011-12. He has been unable to regain his prior trajectory, struggling in particular with heightened walk tallies. Astros outfielder Alex Presley has cleared waivers and is now deciding whether to accept his outright assignment, Ken Rosenthal of FOX Sports reports (Twitter links). He is expected to accept the assignment in order to retain his $1MM salary, per the report. Righty Alex White has also cleared waivers and has been assigned to Houston’s Triple-A affiliate, MLB.com’s Brian McTaggart tweets. Veteran righty Matt Capps has re-signed with the Braves, SB Nation’s Chris Cotillo reports on Twitter. The former Nationals closer had been with the club this spring but was released. Capps, 31, gave up two long balls in his only two innings of work, and has thrown just 12 professional innings over the last two seasons. The Mariners have loaned lefty Rafael Perez to Mexico’s Quintana Roo Tigers, Bob Dutton of the Tacoma News Tribune tweets. Perez, 32, was once a mainstay in the Indians’ pen and owns a 3.64 ERA over 329 big league innings. His peripherals declined, however, and he has not pitched in the big leagues since 2012. Perez has put up strong numbers in the upper minors over the last two years, however, and even returned to working as a starter last year. Former top draft pick Josh Smoker has signed with the Mets, Adam Rubin of ESPNNewYork.com reports. The 26-year-old, who washed out of the Nationals’ system, is said to be working back into the mid-90s with his fastball. TUESDAY: White has been placed on outright waivers, Drellich reports. SUNDAY: The Astros have designed right-hander Alex White for assignment, Evan Drellich of the Houston Chronicle reports. Between this move and designating Alex Presley for assignment earlier this week, Houston now has two 40-man roster spots for Roberto Hernandez and Joe Thatcher. White was selected by the Indians as the 15th overall pick of the 2009 draft and was formerly a high-rated prospect, ranked as high as 47th in Baseball America’s preseason list of the top 100 prospects in the sport prior to the 2011 season. He has struggled over 149 Major League innings with Cleveland and Colorado in 2011-12, posting a career 6.03 ERA with 6.09 K/9, and 4.58 BB/9 and he also missed all of the 2013 season recovering from Tommy John surgery. White and Presley are two of the four players currently in “DFA limbo” according to the MLB Trade Rumors DFA Tracker. The two Astros join the Yankees’ Austin Romine and the Tigers’ Chad Smith in awaiting their next assignment. The Indians have overhauled their roster via free agency this season, adding the likes of Nick Swisher, Michael Bourn, Brett Myers and Mark Reynolds on Major League deals while bringing in notable veterans such as Matt Capps and Daisuke Matsuzaka on minor league pacts. At the 2011 Trade Deadline, however, the Tribe addressed its biggest needs in a different manner, dealing a package of four prospects to the Rockies in exchange for then-ace Ubaldo Jimenez. Cleveland traded right-hander Alex White (22 years old at the time), first baseman Matt McBride (26 at the time), righty Joe Gardner (23 at the time) and lefty Drew Pomeranz (22 at the time) to Colorado in exchange for Jimenez, who had at least two and a half years of team control remaining on a low-cost contract. It was a steep price to pay, as Pomeranz and White represented the Indians' first-round picks from the previous two drafts. Gardner, meanwhile, had entered the season as Cleveland's No. 9 prospect, according to Baseball America. 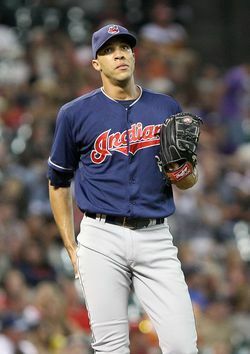 Ubaldo Jimenez: To say Jimenez has been a disappointment in Cleveland would be putting things lightly. In 242 innings with the Indians, Jimenez has a 5.32 ERA, 7.6 K/9 and 4.5 BB/9. He entered 2012 with a career ground-ball rate near 50 percent, but saw that mark plummet to 38.4 percent last year. His once-blazing fastball has dropped from an average of 96.1 mph from 2009-10 to just 92.5 mph in 2012. His 4.8 BB/9 last season was a career-worst, and he led the American League in both losses (17) and wild pitches (16). In spite of all that, Indians GM Chris Antonetti exercised the team's $5.75MM club option on Jimenez this past offseason in hopes that he can rebound to something in the vicinity of the ace-caliber pitcher he once was. Jimenez is just 29 years of age still, and the price was right for Cleveland to give him another shot. His performance in 2013 will be one of they key factors in Cleveland's fate as their revamped roster makes a run at dethroning the reigning AL Central champion Tigers. Drew Pomeranz: Pomeranz has a 5.01 ERA in 115 big league innings for the Rockies. His 1.9 K/BB ratio isn't exactly inspiring, but he was significantly better in a small minor league sample last season. Pomeranz posted a 2.31 ERA, 8.9 K/9 and 3.7 BB/9 in 50 2/3 innings between Double-A and Triple-A (46 2/3 of which were at Triple-A). He's still just 24 years old and is one year removed from entering the season as BA's No. 30 overall prospect and MLB.com's No. 24 ranked prospect. His fastball was down to averaging 91.2 mph season after previously sitting several ticks higher, but BA noted prior to 2012 that his ability to keep the pitch down in the zone and his deceptive delivery allowed the pitch to play at lower velocity. If Pomeranz can regain some of his velocity and/or hone his command of the strike zone, there's still time for him to blossom into the No. 2 starter BA and MLB.com projected him to be. Alex White: Like Pomeranz, White struggled greatly in his Major League time with the Rockies. He posted an unsightly 6.30 ERA in 134 1/3 innings for the Rox from 2011-12. His marks of 5.9 K/9 and 4.5 BB/9 were significantly worse than his Triple-A rates of 7.8 and 3.0, respectively. White put the ball on the ground frequently in 2012 (54.1 percent) but lost more than a mile per hour off his fastball, dropping to a 91.2 mph average (identical to Pomeranz's, oddly enough). White was injured at the time of the trade and missed 82 games in the 2011 season with a strained ligament in his finger. How much that impacted his 2012 results remains to be seen, but he'll have a chance to prove he's worthy of a spot in a Major League rotation. It won't be with the Rockies, however, as the team traded White to the Astros along with Alex Gillingham to acquire ace setup man Wilton Lopez. Joe Gardner: Gardner ranked as Colorado's No. 25 prospect prior to the 2012 season but dropped off the club's Top 30 list this year. He ranks 18th among Rockies' farmhands according to MLB.com's Jonathan Mayo, however, who calls Gardner's sinking fastball a "groundball machine" and notes that his change-up has some deception that leads to swings and misses. He also features a "slurvy" slider that Mayo grades out to be slightly better than his change but worse than his fastball. Gardner worked primarily as a starter at the Double-A level, but Mayo notes that he was very sharp in a five-appearance bullpen cameo. In total, Gardner compiled a 3.97 ERA, 6.4 K/9 and 2.5 BB/9 in 138 1/3 innings during his age-24 season. Today is his 25th birthday (Happy birthday, Joe! ), and should have a chance to crack the big league roster this season with a strong minor league performance. Matt McBride: McBride is currently Colorado's 33rd best prospect, according to BA, though they note that most of his value comes as a utility player due to the fact that he can play catcher on occasion. BA notes that he's a poor defender whether behind the plate, in right field or at first base, and that his ability to make frequent contact is accompanied by a lack of home run power. McBride hit .205/.222/.308 in 81 plate appearances for the Rockies last season, walking only once and whiffing 17 times. He did manage a .344/.365/.535 triple slash line at Triple-A. Still, at 27 years of age, he's not much of a prospect at this point, which was reflected in Colorado's decision to remove him from the 40-man roster in November. That Joe Gardner and Matt McBride posted the best 2012 numbers of anyone involved in this trade is a telling sign. To be blunt, the deal currently doesn't look good for either side. A rebound campaign for Jimenez or a breakout from Pomeranz would alter that, but surely both teams had visions of aces in their minds when pulling the trigger on this deal — not a host of 5.00+ ERAs. Colorado picked up some value in flipping White for a strong bullpen arm with three years of team control remaining, though that could prove regrettable if White puts it all together as an Astro. For the time being, three teams are simply left hoping that they can squeeze some value out of the once highly regarded talent in this deal. A trade is still the more likely means for Colorado to acquire starting pitching help, according to Renck. Teams are calling about Dexter Fowler and Michael Cuddyer. Renck notes that the two years and $21MM remaining on Cuddyer's contract may be appealing to teams, given the inflated prices we've seen in this year's free agent market. The one-year deal signed by Jeff Francis last night will pay the southpaw somewhere north of $750K salary that he earned in 2012. Renck also writes that the team included Alex White in this week's Wilton Lopez trade because they no longer viewed White as a starter. Within that same piece, Renck reports that in trade talks prior to the Winter Meetings, the Rockies asked for Mike Minor and one of Julio Teheran or Randall Delgado in exchange for Fowler. Needless to say, the price on Colorado's center fielder remains high. There are still no winners in the trade that sent Ubaldo Jimenez to Cleveland for Alex White and Drew Pomeranz, Troy Renck of the Denver Post writes. White and Pomeranz have been disappointments in the year-plus since the 2011 trade and both must improve the command of their secondary pitches to start seeing better results, Renck writes. The Mets are expected reduce their losses from the $70MM range to $23MM this year, Josh Kosman of the New York Post reports. The Mets cut their payroll considerably last offseason and it currently sits in the $94.5MM range, according to Cot's Baseball Contracts. Their payroll is expected to stay in the same range for 2013. Jurickson Profar belongs at the MLB level even if he isn't as physically imposing as some of the sport's other young stars, Yahoo's Jeff Passan writes. Profar, the 19-year-old shortstop prospect who was recently called up by the Rangers, has impressive makeup at a young age, Passan writes. Neither Roberto Alomar nor Bert Blyleven will be wearing a Cleveland cap into the Hall Of Fame tomorrow, but both men spent significant parts of their careers with the Tribe. Blyleven won 48 games and posted a 3.23 ERA with the Indians between 1981-85, twice finishing third in AL Cy Young voting in that span. Alomar played in Cleveland from 1999 through 2001, earning Gold Gloves and All-Star appearances in each year and hit .323/.405/.515 as an Indian. Onto some news about the modern-day Clevelanders, courtesy of Paul Hoynes of the Cleveland Plain Dealer…. Lonnie Chisenhall, Jason Kipnis, Drew Pomeranz and Alex White are "all but untouchable" in trade talks. Without these top prospects on the table, however, it makes it unlikely that the Indians will be able to acquire top-tier trade candidates like Carlos Beltran or Hunter Pence. Hoynes notes that the Tribe's dealings are tempered by the fact that while they have a chance to win the AL Central, they probably don't have a realistic shot at the World Series so the team doesn't want to mortgage the future for just a token playoff berth. The Indians have talked to the Dodgers about utilityman Jamey Carroll. Cleveland's interest may have cooled, though, now that Kipnis has been called up. The Rockies and Brewers have shown interest in Carroll. MLBTR's Tim Dierkes explored Carroll's trade candidacy and also had a Q&A with the veteran last month. The Indians "aren't close" to working out a deal with the Padres for Ryan Ludwick or Aaron Harang, reports Hoynes (Twitter link). We recently heard that Harang (along with Hiroki Kuroda) were Cleveland's top two targets on the trade market. Carlos Quentin attributes his strong start to learning how to leave the game at the ballpark and how to cope with failure, writes Tim Kurkjian for ESPN.com. The Royals will look within their organization for bullpen help, as Bob Dutton of the Kansas City Star reports the club doesn't want to risk losing anyone from their current 40-man roster. "Kansas City baseball fans have grown sick of money," writes SI's Joe Posnanski, noting that fans seem to appreciate how the Royals are spending on their minor league system rather than on stop-gap veterans. Posnanski points out that K.C. 's league-low payroll could (or should) be even lower given the Royals are paying Kyle Davies and Jason Kendall a combined $6.95MM in 2011. Right-hander Alex White, the Indians' first-round pick (15th overall) in the 2009 amateur draft, will make his Major League debut on Saturday. The Tribe will have to make room for White on the 40-man roster — Paul Hoynes of the Cleveland Plain Dealer thinks the club could move one of their several infielders, while speculates that right-hander Jess Todd could be the odd man out. Also from Castrovince, right-hander Adam Miller has been cleared to pitch for the Indians' Class A affiliate. Miller was picked 31st overall by Cleveland in the 2003 amateur draft, but hasn't pitched since 2008 due to four surgeries on his right middle finger. Miller, 26, has a 3.51 ERA, 8.7 K/9 rate and a 3.19 K/BB ratio in 104 minor league appearances (94 of them starts). The Indians signed 15th overall pick Alex White for $2.25MM, according to Jim Callis of Baseball America. Slot: $1.557MM. Click here for MLB.com's scouting report on the UNC righty.